Dear World. I have many exciting things in the works. I am looking forward to sharing some new stuff with you all soon, but first I have to get through this next week which is set to be crazy busy. Busy is good though! So for now, I leave you in suspense, although I will share a little peek of my last adventure with my amazing adventure friend Ashley.. I LOVE the logo!! Looks so great on your pics. Excited to hear about these new things, how anticipating!!! Thanks so much Karla! Going to check out your blog now!! That's a gorgeous picture. I'm a relatively new follower and I'm excited to see what's coming up! 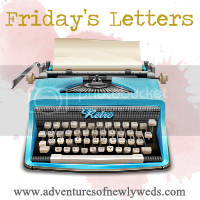 Visiting from Friday's Letters! You've got a super cute blog! That photo is amazing!!! Excited to see what you have in store!! Thanks so much Brhea! Thanks for following along! Going to check out your blog now.. This is such a beautiful image! I love the soft feel!